From sandwiches overflowing with tasty fillings to decadently delicious organic pastries, all our Délices goodies can be ordered for your office or special event. Check out our menu for lunch, afternoon tea or breakfast. We can make organic mini-pastries for your special breakfast (they are half price!) but Géraldine will need 1 week notice for them! Business event, birthdays, weddings, anniversaries, Christmas – whatever you’re organising we have our sweet and savoury menu at your disposal. All our gâteaux are made on individual portions, and some of them can be offered in a bigger version. So you can choose not to choose, and have several different individual cakes! Or your dream can become true with your favourite cake made as big as you want! Celebrated since the 18th century and named after the very famous street in Paris. A crown of caramelised choux (filled with vanilla crème pâtissière) and its generous heart of crème Chantilly. This monument of French decadency lays on a dainty disk of sweet shortcrust pastry. A creation after the famous Pierre Hermé’s Ispahan. A large macaron filled with a delicate litchi & rose cream, surrounded by tangy fresh raspberries. A traditional rich and thick open pie filled with milk, eggs, sugar and vanilla. A soft and moist cake made from butter and eggs, soaked with fresh orange juice. Topped with dark chocolate and homemade crystallised orange peel. A graphic tower of different texture and tastes: Madeleine sponge, Apricot compote, Pistachio mascarpone mousse, toasted glittery pistachios, apricot pâte de fruit, and golden orange tuile biscuit. A delicate soft and light sponge, made with strawberry marmalade, strawberry confit, mascarpone mousse, strawberry pâte de fruit, homemade strawberry crisp. 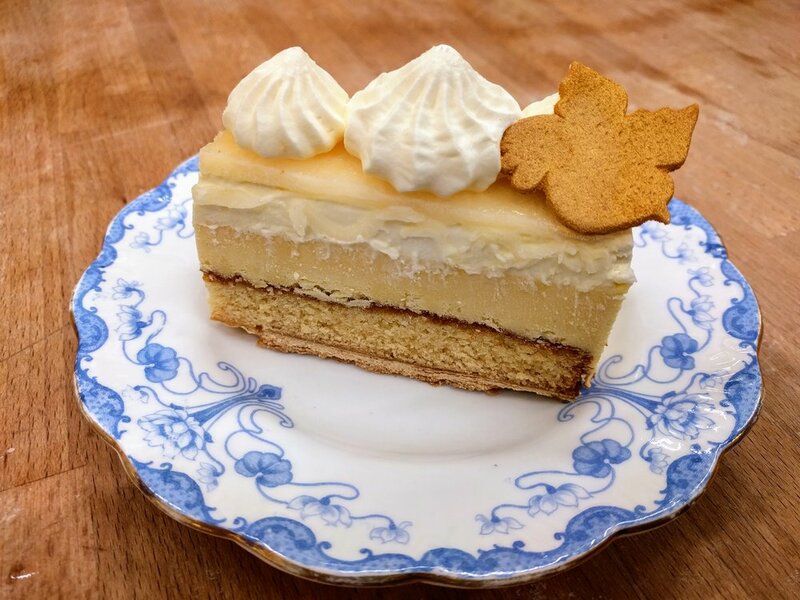 A perfect gâteau for the connoisseurs: Layers of soft biscuit joconde (almond soft sponge), Bourbon vanilla white chocolate ganache, all topped with Tahiti vanilla mascarpone whipped cream. The very French classic. We make it with homemade buttery caramelised puff pastry and an airy vanilla crème princesse. A homemade raspberry coulis nestled in a mousse made of vanilla pods from Bourbon and Tahiti. The bombe rests on a soft biscuit génoise coated with a thin layer of crunchy white chocolate. Comes only in individual portion. A classic summery French cake. It is made of a Génoise biscuit and a lavish layer of fresh strawberries, topped with a lush crème mousseline vanilla. Coated with marzipan on your demand. The classic lemon tart with an Italian meringue: pillowy on the inside and slightly crunchy on its outside. Our most indulgent gâteau. Dive into layers of caramel crème brûlée, dark chocolate biscuits soaked with salted butter caramel sauce and a rich, dark chocolate mousse. Topped with a swirl of coffee Chantilly and a glittering meringue. For every Xmas Diana presents her 4 new creations fruity or chocolatey. You will have to call us on November to discover them! Discover Diana's unique handmade creations every Easter! They come in dark, milk or white chocolate of the finest Belgian cocoa.